…did anybody watch that documentary on facial castings of historical figures that aired a couple of nights ago? If you didn’t, it’s running again in early November. If you didn’t catch it, they took life masks and death masks of notable individuals, scanned them into a computer, and added color and other enhancements to create three-dimensional representations of what these guys actually looked like. The idea is that what you end up with is as accurate as a facial cast, but you can move it around and manipulate it. You can make Lincoln smile and blink, you can take out Washington’s dentures to see the natural shape of his jaw, and so on. It was morbidly fascinating, and parts of it were instructive. 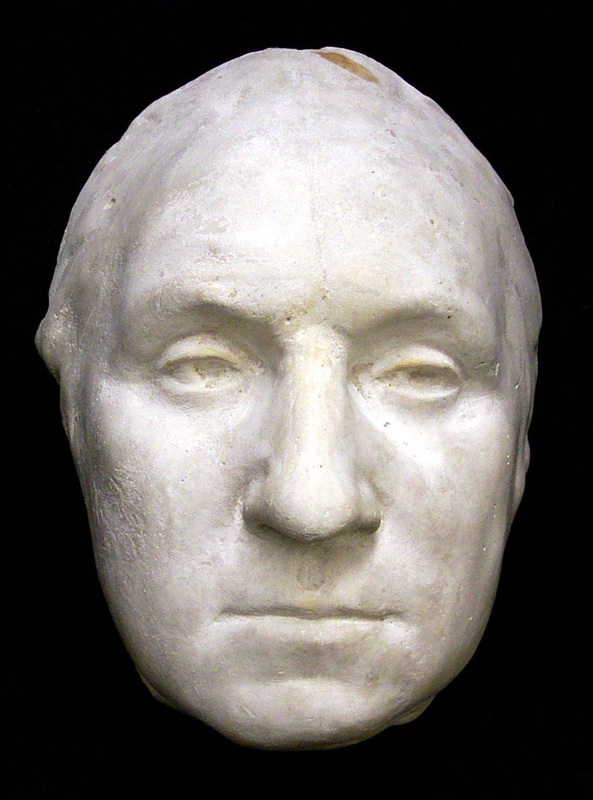 (Who knew Washington’s mouth was so flabby without his false teeth in there?) It’s hard to deny the captivating power of facial casts, and the insight they give us into a person’s appearance that transcends anything you can get from a painting or sculpture. I got a little irritated, though, at all the overselling of results. Now, for the first time, we can see Washington as Martha saw him! Here, for the first time ever, is the real face of Lincoln! Scientists, doctors, and technicians who dabble in history have this tendency to overstate the implications of their work. I don’t deny that the hard sciences sometimes offer historians a certainty that’s very appealing. The only catch is that what they can tell us is often so very limited. They can reconstruct Washington’s appearance, but not his world. They can show us Lincoln’s face, but not what was going on behind it. No high-end scanner or empirical test is going to answer these types of questions, the questions that demand the kind of research and analysis that historians have been doing for a long, long time. It’s a fair question. I’ve got plenty of opinions about some of the recent changes at Gettysburg—the new exhibits, the tree-cutting, the public-private relationship—and I’ve discussed them on this blog a number of times. For the most part, I’m pretty favorable about them. The field is closer to its original appearance, thanks to the tree-removal and the closing of the old Visitor Center. I like the new exhibits; I fully agree with the critics who claim that the focus should be on the battle itself, but I found that the new museum explains the battle much more effectively than the old one. And as for the public-private partnership, I’m fine with it. In fact, private non-profit support groups are pretty much standard for any historic site or museum that’s also a government entity. Plenty of people will donate to a private foundation; few will do so to a government agency. (I ran a museum for a little while that was a government department, and all our fundraising was through the private non-profit group associated with us.) I can see how Latschar assuming leadership of the Foundation might be questionable, but the partnership with the Foundation isn’t anything but standard museum/preservation practice. As for the computer scandal and Latschar’s transfer to a desk job, though, I’m afraid my answer is going to sound disingenuous. I actually don’t have an opinion about it. I don’t know Latschar personally, of course, and I’m not privy to any information about this that hasn’t been in the press or made public. I don’t know what the standard punishment is for this type of misuse of a Department of the Interior computer, so I can’t say whether he got off easy or not. I will say that news of his transfer surprised me. I expected the whole thing to blow over. What I find really striking about Latschar’s transfer—and everything that’s happened at Gettysburg in recent years—is the public interest generated. I can’t think of any other historic site or public historian that has generated so much passion and controversy, from the dispute over the Electric Map to this last round. In fact, I think the Electric Map controversy has generated much, much more interest than the complete loss of Brandywine Battlefield’s state funding; the dismantling of a single exhibit got more attention than the closure of one of the most important Revolutionary War sites. Gettysburg, in other words, is another animal altogether. I doubt any other historic site could have been the center of such passionate discussion as has centered around it for the past few years. I don’t like seeing so many history devotees disagree with each other, but the disagreement shows that they all care about the place—and that’s a very good thing. One of the questions people ask me when they find out what sort of thing I do for a living is whether I watch the History Channel. They’re usually a little surprised when I tell them that I don’t watch it much at all. Part of it’s due to the fact that I just don’t watch as much TV as I used to, but another part of it’s due to the fact that the network itself has changed. In fact, I found it extremely ironic that the network dropped the “channel” from its name last March and changed its handle to “History.” Sticking to the “channel” part would have been more appropriate. So many of the more heavily-publicized shows have nothing to do with the study of things that happened in the past. Instead, they’re about trivial things that are currently happening, things that aren’t happening, or things that may never happen. Still, history can claim a good deal more public interest than most academic disciplines. Commercial history books routinely make the bestseller lists, and thousands of people patronize historical sites. You’d think there would be enough public interest in history to keep the network supplied with viewers. And when History does generate its own original, history-oriented programming, it’s quality stuff. They clearly know how to do it well; they just don’t do it often. I’m not saying that History has some kind of public obligation to show educational, history-driven programing to the exclusion of everything else. They’re in the entertainment business. In that business you respond to what people want, and what we seem to want more than history is the same sort of thing we can get elsewhere. A second reason I try to focus on history here is just because it’s what I know the most about, given my educational and vocational background. I agree wholeheartedly with an insightful statement by John Lawson: “The irony of the Information Age is that it has given new respectability to uninformed opinion.” The last thing I want to do is to contribute to all the superfluous noise out there. Still, one of the universal human traits is a tendency to ponder those big questions about the meaning of life, the state of the world, and what to do about it. And an equally universal trait is to expound your conclusions to anybody who’ll listen. So at the suggestion of a friend of mine, I’ve started another blog about this very thing. If you’re interested, you can find it here. If you’re not, there’s nothing to fear. It’ll still be business as usual here at this blog. That’s it for the cross-promotion. Scout’s honor. Anybody else having a hard time thinking of instances in which Columbus has been “often portrayed in pop culture” at all these days, let alone nobly? In Pennsylvania, a group of fourth-graders “put Columbus on trial this year — charging him with misrepresenting the Spanish crown and thievery. They found him guilty and sentenced him to life in prison.” I’m not sure what constitutes “misrepresenting the Spanish crown,” but it must be serious. I hate to imagine what they’d do to Coronado. 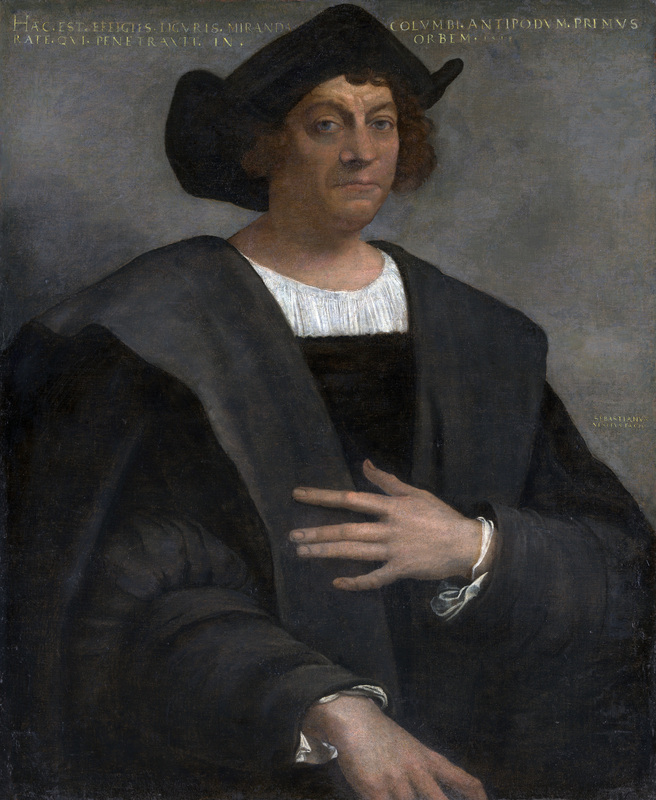 Blaming Columbus for all the unfortunate side-effects of European colonization and emphasizing his character flaws aren’t news. This has been standard operating procedure in both academic and popular circles for some time now. Why the AP is just now taking notice of this, I have no idea. I’ve always known that the media don’t pick up on intellectual trends until long after they’ve begun to permeate the popular consciousness, but I didn’t know it took decades. Or maybe today was just a really, really slow news day. When you hear “Cumberland Gap,” you probably think of Daniel Boone and the role the pass played in westward expansion. But the Gap has quite a Civil War history, too. It was the right anchor of the Confederacy’s defensive line in the West and changed hands four times. This weekend Cumberland Gap National Historical Park is hosting a Civil War event, so let me take this opportunity to direct your attention to this summary of the war in the Gap by my good friend and former boss Steven Wilson. When I taught a course on the American Revolution last year, we spent a lot of time talking about the ideas that shaped American responses to British colonial policy in the 1760’s. There were several important ideological factors at work in American political thought during that period—a mistrust of power, a pervasive fear of conspiracies, and an emphasis on the need for public virtue. And, of course, there was the conviction that government could not deprive citizens of their property without the consent of those citizens, an idea summed up in the familiar phrase “no taxation without representation.” Since Americans didn’t send representatives to Parliament, so the argument went, that body had no authority to levy taxes on the colonies. No American had any role in deciding who went to Parliament, so no American had any voice in the decision to pay taxes that Parliament demanded from the colonies. The history of ideologies always makes for a good classroom discussion, so I introduced this idea by asking my students why we modern Americans consider our government sovereign. I assumed that they’d respond that it’s because we elect the government, therefore delegating some of our authority to them so they can exercise it for our benefit. I’d then point out that no members of Parliament were elected by American colonists, and we’d all have a handle on why the principle of Parliamentary taxation was so controversial in America. Then I’d go home and pat myself on the back for drawing a stimulating analogy. What happened was that my students stated pretty unanimously that we consent to the government’s dictates because the government has the ability to enforce compliance. In other words, we do what the government tells us not because our electing them gives them authorization to pass laws, but because we’ll go to the federal pen if we don’t. I hadn’t planned on that response, and it threw me off a little. This semester I’m teaching an introductory course on American history, and a similar thing happened. Contrasting the colonial and British forms of government with the one that emerged in the wake of the Revolution, I drew a distinction made by Gordon Wood in his important study of the Revolution as an act of political creation. 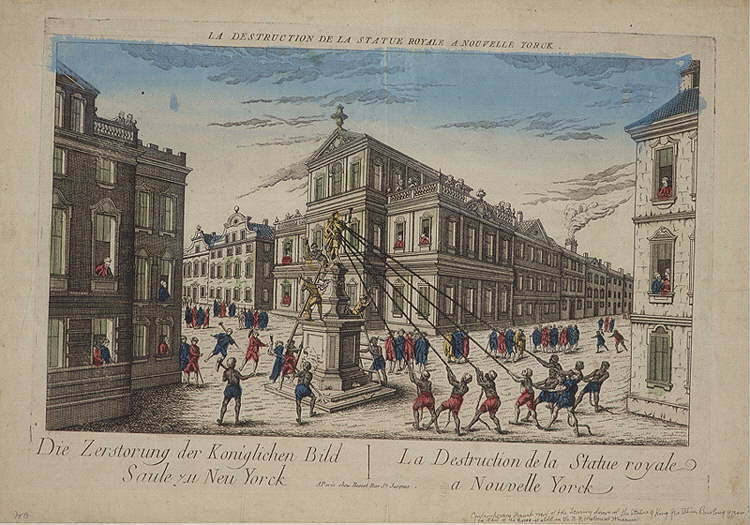 New Yorkers celebrate America's independence by pulling down a statue of George III in 1776. Library of Congress Prints and Photographs Division, LC-USZC4-1476. England’s government incorporated different components of traditional European society; the monarchy, the aristocracy, and the commons were all represented in some fashion. Americans, by contrast, came to understand that the only component of their society was the people. Having severed their ties to the monarchy, Americans didn’t need an executive who represented the king’s interests, which is what the royally-appointed colonial governors were supposed to do. And lacking an aristocracy, the Revolutionaries didn’t have to work out the relationship between a House of Lords and a House of Commons. Everybody in America was a “common.” The result was, as Wood argues, a new way of thinking about politics. The government became the people’s creation. The people were the only real source of sovereignty, and they temporarily delegated some of that sovereignty to the government, which would act in the people’s interest. Again, I was surprised at my students’ response. (Remember, this is a totally different group of students than the ones I discussed earlier.) When I launched into my little spiel from Wood about the sovereignty of the people as a unique legacy of the Revolution, they snickered. It was clear they didn’t think the American way of doing government still worked that way. Not in practice, where the rubber actually meets the road. So here I had two different groups of students, composed of very different individuals, at different times, and they all agreed that the American notion of government by and for the people was nothing more than a warm and fuzzy fiction. Every student in both of these classes seemed to believe it, whether Republican or Democrat. It had nothing to do with who was actually in power, or which party the individual students wanted to be in power. It was just an eternal truth of politics, as inexorable as the changing of the seasons. On one hand, there’s some obvious continuity here with the political ideas of the Revolutionaries. Eighteenth-century Americans responded to British taxation with horror partly because they mistrusted power and the people who wielded it. They saw political power as something inherently dangerous and invasive, and therefore you had to watch the powerful like a hawk. On the other hand, this attitude is quite different from that of the Revolutionary generation. The Revolutionaries’ mistrust of power was fundamentally active. They didn’t just harbor suspicions about authority; they moved to rectify any occasions when they believed the imperial authorities had overstepped their bounds. Their mistrust of government led them toward political engagement. It seems to me that this more modern form of mistrust has the opposite effect. It leads to passivity. All those bums in power are going to look after themselves, and they’re not like us, so we’ll keep our heads down and hope they keep the damage to a minimum. The ironic thing is that the generation that created our American notion of a government of the people were born into a world that was far less democratic than our own. Their parents and grandparents took it for granted that all men weren’t created equal, and that the uncommon few had more business being in control than anybody else. And yet they were evidently more optimistic about the potential of representative government than we are today, having enjoyed its benefits for over two centuries. I’m not saying my students’ negative view of modern America is either right or wrong. I am saying that it seems a shame to start assuming that we’ve just gone back full circle to the world the Revolutionaries left behind.